Say “I Love You” With This Cup Cake Valentine’s Cosy! February is the month of love, and if your Valentine likes tea, making them this cosy is a great way to say “I love you”! Designed by Claire Garland from her cottage by the sea in Penzance, this tea cosy pattern is a quick and easy one knit up in less than a day. Claire is the founder of Dot Pebbles – a collection of cute knitted dolls and outfits which you make yourself. She also makes knitted toys and creatures, and has a few books available full of knitting patterns, including Knitted Babes, Knit and Purl Pets, and Toys to Sew, which can be found on her website. 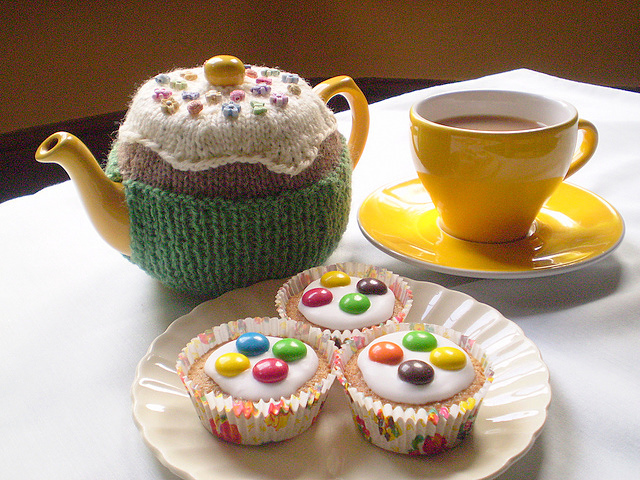 This Valentine tea cosy was knitted with Debbie Bliss Donegal Luxury Tweed Chunky and is worked on 5mm (US8) double pointed needles, with the cup cake and hearts knitted afterwards and sewn on top. You can follow Claire’s blog here. Cute Christmas Cosies to Knit! 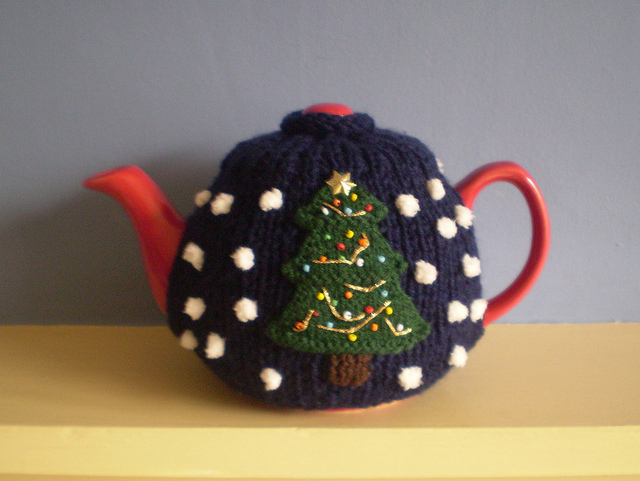 We said we would feature some free Christmas tea cosies for you to get your teeth into, so here is the first one 🙂 This festive ribbed tea cosy was designed by Frankie Brown (thanks Frankie for the submission!). 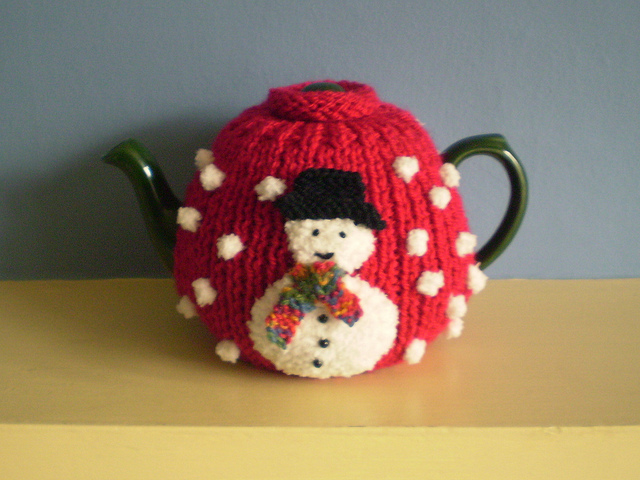 The tea cosy is made in rib stitch and the snowman and christmas tree designs are knitted and sewn on afterwards. Instructions are clearly written out to knit each part, the snowman himself, his hat and scarf, the snowballs and the christmas tree, which is then decorated. We featured Frankie recently when we found one of her free knitting patterns online. She asks that if you do make one of her patterns that you leave a donation on her Just Giving Page. For more festive Christmas knits, garlands, blankets and toys, see her Ravelry. 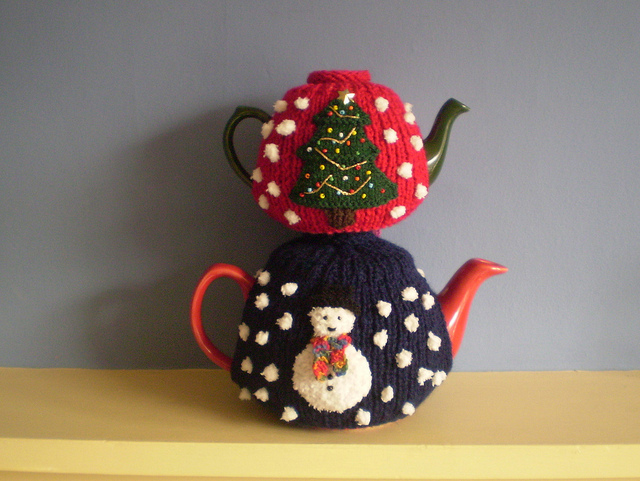 Click to download the Christmas Tea Cosy pdf! 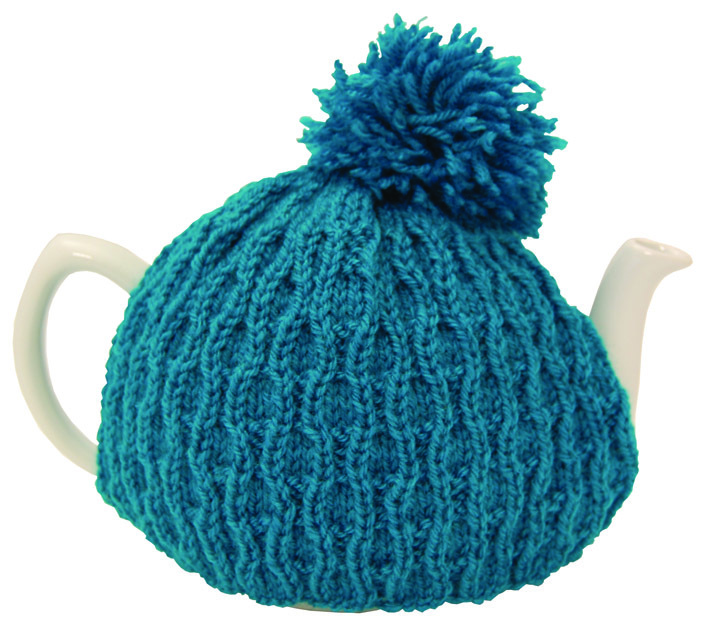 This week’s free tea cosy knitting pattern is the snug fitting “Tea_Mitten” designed by Elisabeth Kleven from Canada. 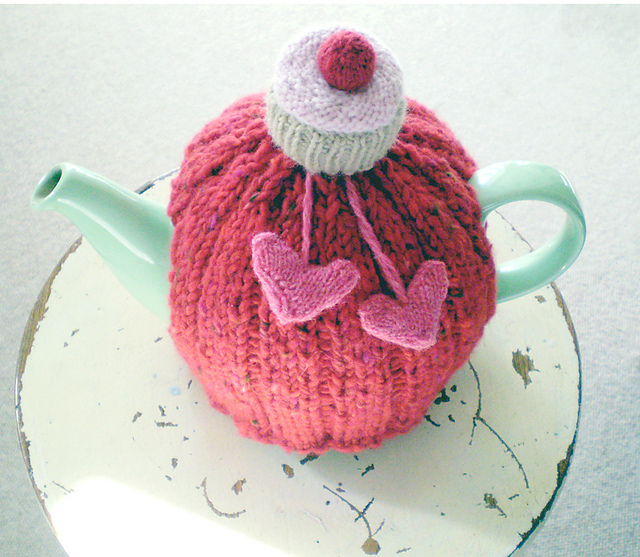 Elisabeth designed this teapot cosy so it wouldn’t have to be completely removed, making it more difficult to lose! The lid is uncovered so the tea can be topped up, and cleverly, she has created a “thumb gusset” for the spout, ensuring the tea stays toasty warm and cosy until the very second it is poured into the teacup. 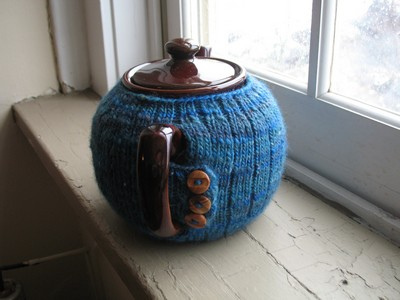 The rib in the pattern ensures the cosy is snug against the pot – Elisabeth says it was designed not to obscure her teapot ‘s “lovely curves”, and the flap around the handle keeps everything secure. Elisabeth learned to knit as a teenager because she wanted to make a Harry Potter scarf. (I made one of them too!!) She kindly let us use her free pattern this week so make sure you pay her ravelry page a visit to check out her other knitting patterns! Happy days at Cosy HQ – because yesterday our first full shipment of tea arrived and boy, does the warehouse smell fantastic! Fresh peppermint and creamy vanilla cannot be held back by mere packaging and are flooding the air with their beautiful scent. It’s a pretty nice place to hang out right now. The orders are flooding in too – which is hugely exciting as it means that within a matter of weeks, Cosy is going to be out there in an ever-increasing number of cafés for punters to slurp! I just can’t wait to stumble across it when I’m out and about – I just hope people enjoy it as much as we do. On the knitting front, the novices amongst us have been taking our first tentative steps towards ‘casting on’ and knitting a few tricky rows. Purl stitch is a subject of much debate, as despite following various clear instructions, we’re not entirely sure any of us have actually achieved it…Something is obviously going wrong. 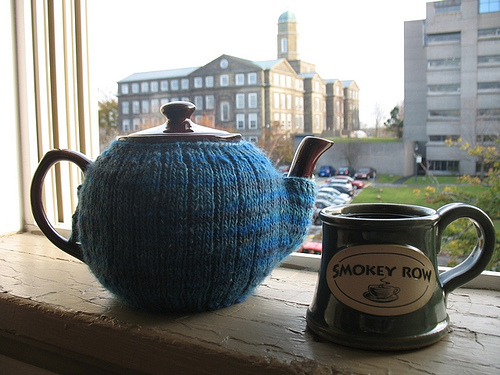 Needless to say, with such pitiful progress, we are still oceans away from knitting an actual tea cosy. 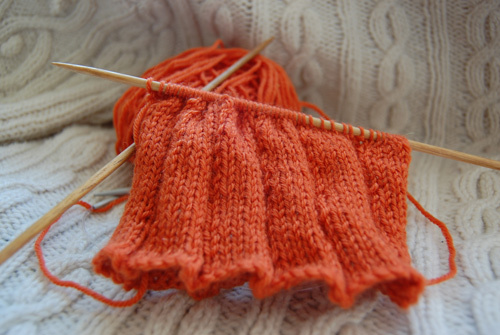 Beginners, see this great ‘How to Knit Guide’ to get you started! For those of you who have mastered the basics, a lovely lady called Nicola has given us her free pattern for a wave-rib tea cosy – just like the one featured on the Peppermint Tea pack. It’s free to download on our website www.cosy-tea.com, or on the ‘Free Patterns’ link at the top of your screen.